Ayurveda, discovered and developed in India 5000 years ago, is the science of Life. One of the primary principles that Ayurveda is based on, is that of the of three Doshas : Vata, Pitta, Kapha. Doshas are the energies that make up every individual and are found throughout the human body and mind. They govern all physical and mental processes and provide every living being with an individual blueprint for health and fulfillment. The Doshas derive from the Five Elements and their related properties. Each of the Doshas is predominantly composed of two elements. As with the 5 elements, all three of the Doshas are found in everyone, but in different proportions. 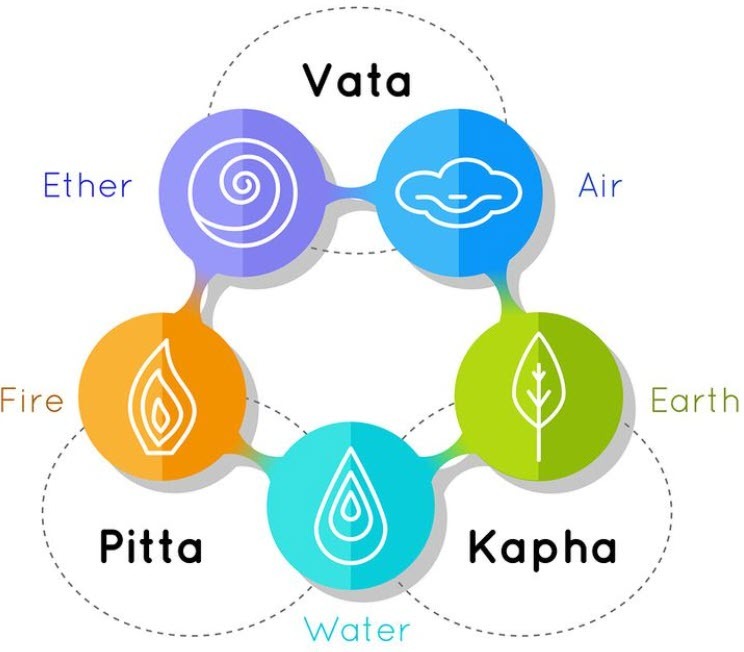 The particular ratio of Vata, Pitta, and Kapha (Ayurvedic constitution) within each of us provides us with a blueprint for optimal health, and significantly influences our individual physical, mental, and emotional character traits. Vata – A person with a predominantly Vata constitution will have physical and mental qualities that reflect the elemental qualities of Space and Air i.e. dry, rough, light, cold, subtle, and mobile. That is why Vata types are commonly quick thinking, thin, and fast moving. Pitta – is the energy of digestion and metabolism in the body that functions through carrier substances such as organic acids, hormones, enzymes, and bile. While Pitta is most closely related to the element of Fire, it is the liquid nature of these substances that accounts for the element of Water in Pitta’s make-up. The qualities of Pitta are oily, sharp, hot, light, moving, liquid, and acidic. Hence a Pitta type personality will have a fiery personality and oily skin. Kapha – A Kapha Person will typically have a solid bodily frame and calm temperament, reflecting the underlying elements of Earth and Water i.e. moist, cold, heavy, dull, soft, sticky, and static. Kapha is the energy of building and lubrication that provides the body with physical form, structure, and the smooth functioning of all its parts. Kapha is the essential cement, glue, and lubrication of the body into one frame. Individuals with the respective Body/Mind type will display physical and mental characteristics that reflect the above qualities in both a balanced and an imbalanced state. Where do the Doshas reside and what do they govern? Psychological Traits communication, creativity, flexibility, and quickness of thought governs joy, courage, willpower, anger, jealousy, and mental perception. It also provides the radiant light of the intellect. governs love, patience, forgiveness, greed, attachment, andmental inertia. A balanced state is not necessarily 33.333% presence of each of the Doshas. If the proportion of Doshas in your current state is close to your birth constitution, then your health will be vibrant. A divergence between these states, however, indicates a state of imbalance. Imbalance (due to lack or excessiveness) disrupt proper communication, and cause all sorts of abnormal movements in the body, such as tics, tremors, and muscle spasms. rashes or inflammations of the skin, acne, boils, skin cancer, ulcers, heartburn, acid stomach, insomnia, dry or burning eyes. colds and congestion, sinus headaches, respiratory problems including asthma, allergies, and atherosclerosis (hardening of the arteries). Now that you have fair understanding of the Doshas and their role on your personal nuances, you know the reasons behind your innate strengths as well as some persistent challenges in your life. Cultivating a relationship with each of the three Doshas can provide the most effective guidance in self-awareness and inturn have a transformative impact on your overall health and well-being.